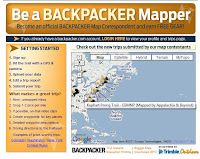 As some of you know, Backpacker Magazine has the 2011 "Be a Backpacker Mapper" contest going on now. The contest is a pretty sweet deal for anyone that has GPS capabilities while they are out on the trail. 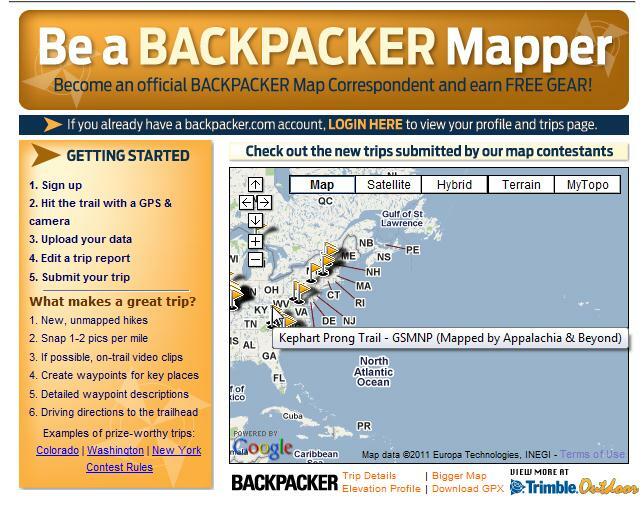 The basic rules for the contest is to map a trail that isn't already in Backpacker's trail database. Another rule is the trail has to be at minimum 3 miles in length. Other requirements include that you have at least 8 descriptive (15 words minimum) waypoints, road access to each trail terminus, 1-2 photos per mile, and a 150 word trail description covering trail conditions, scenery, and other important details of the trail. The submission of your trip is fairly simple. Backpacker uses Trimble Outdoors as it's engine for trip submission. You can use various methods for mapping including any GPS that allows you to upload GPX files to your computer, smart phone GPS apps that allow the same, or by using Trimble Outdoors on your smart phone. Using Trimble is probably the easiest solution as it uploads to Trimble's web app, allowing you to easily edit trail tracks, waypoint information, add pictures from your regular camera, and so much more. Once you've got your trip all set and ready for submission, you simply go to Backpacker's Mapper page and submit the trip. Of course you have to have an online Trimble Account (free) and sign up as a Backpacker online member. 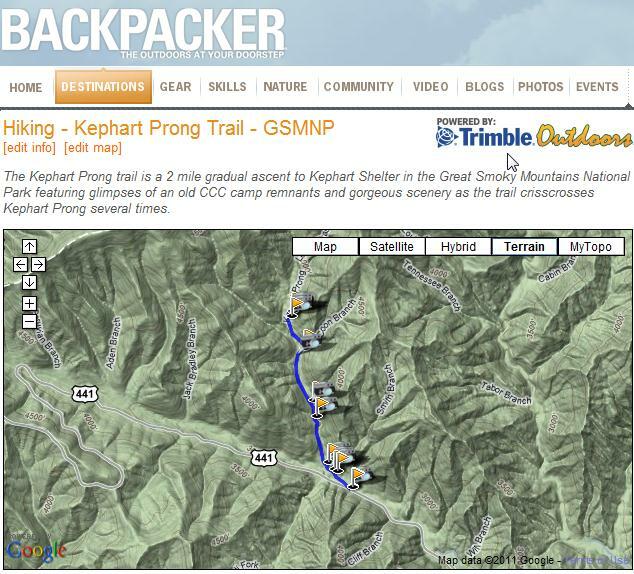 Once that is done you'll have to join the Backpack 2011 Mapper Group on Trimble. This is easily done during the submission process on Backpacker's site. So what's at stake? Some pretty cool prizes are up for grabs even if you aren't the top mapper. When you reach 5 miles, you get an official Backpacker Mapper patch. When you hit 25 miles and for ever 25 miles thereafter, you get your pick from a cool list of gear that includes tents, sleeping bags, boots/shoes, and packs. 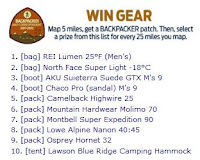 If you are the top mapper(most miles mapped) at the end of the contest, you get a pretty sweet prize package of gear and a trip to map a trip in Colorado with Backpacker staff. Of course, we would love to win a trip to Colorado, but the plain truth is there is no way we could, at least not this year with baby on the way. However, it's not stopping us from participating and adding to Backpacker's database of trails. Beside how cool would it be to be able to sport an official "Backpacker Mapper" patch on your pack? Pretty cool if you ask me. Currently we've already got one trail submitted and it was accepted by backpacker and is actually listed in their mapper trails list for the year. 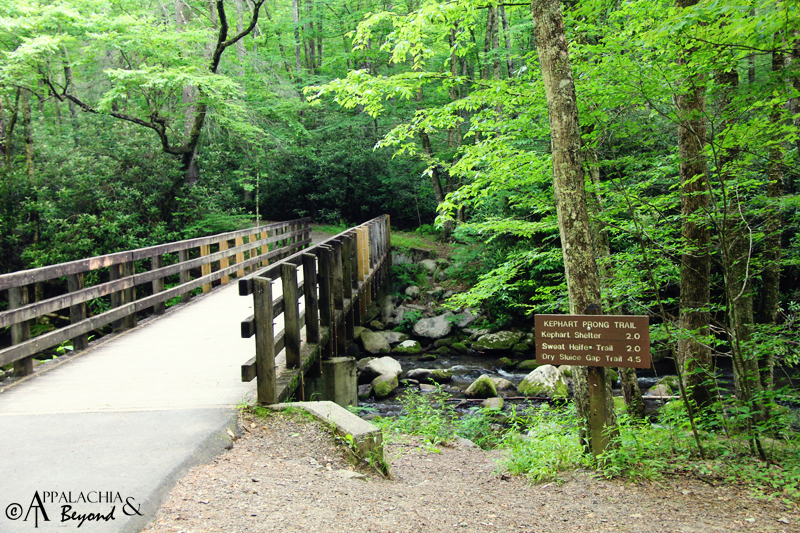 We submitted our hike on Kephart Prong Trail in the Great Smoky Mountains and the week after we submitted it, Backpacker Mapper contest staff reviewed and approved it as an official trail entry. We just need one more trip to get the patch. So what are you waiting for? Break out that GPS, pack, camera, and sense of adventure and get out on the trail and start mapping. Before you know it, you will be an official "Backpacker Mapper" and could score some sweet gear in the process. The contest ends on October 31, 2011 so there's plenty of time to get lots of trips in. To get a better idea of what they are looking for, check out their list of submitted hikes.